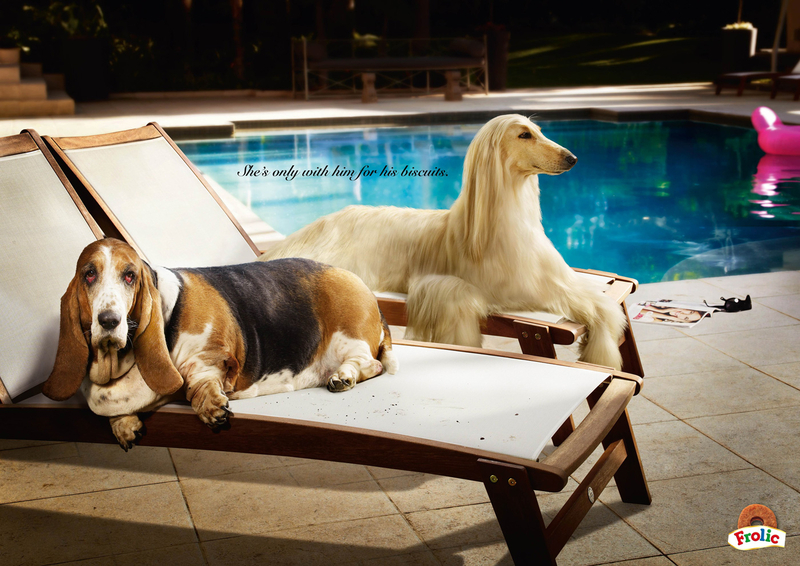 Mars Petfood Frolic, beef and carrot semi-moist rings for dogs, is presented as the food of preference for young and old, fat and skinny, ugly and pretty canines in this print advertising campaign from France. Three canine couples are presented, Bulldog and Poodle in the hotel, Basset Hound and Afghan Hound by the pool, Mastiff and Cavalier King Charles Spaniel in a limo. “She’s only with him for his biscuits”. 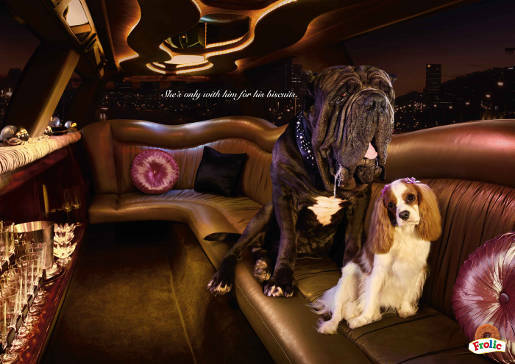 The poodle and bulldog appear in two television commercials, Swimming Pool and Bedroom. The Frolic Dogs campaign was developed at CLM BBDO, Boulogne Billancourt, Paris, by creative directors Gilles Fichteberg and Jean-François Sacco, art director Lucie Vallotton, copywriter Julien Perrard, agency producer/art buyer Sylvie Etchemaite, photographer Clive Stewart, with retouching done at Picto. Filming was shot by director Jerome Langlade via Quad, Clichy, with producer Guillaume Delmas.